A few rainy days in the first week of October had folks putting away patio furniture and calling the chimney sweep. Stepping outside the house into one of our first chilly, cloudy days of Fall, I caught the aroma of a working fireplace in the air. Senses awakened, taste buds tingling for Fall fare. Though the preemie cold snap didn’t last, and we were soon back to daytime temperatures that hovered around 80 degrees, it hinted at things to come. Along with the changes in temperature, two critical indicators tell me it’s officially Fall: The annual college road trips are in full swing and the butternut squash are crowding out spent tomato plants in gardens everywhere. Fall is all about labors of love. Just as the first credit card bills from late Summer back-to-school shopping sprees are arriving in mailboxes, so begin the annual college road trips that are bittersweet and exhausting — mostly for the parents. To celebrate Fall’s arrival — and to escape the endless, mind-numbing job hunt I’ve been on for what seems like an eternity now — I recently accompanied my niece and nephew on one of their college road trips, complete with walking tours of several sprawling university campuses. Beats cruising the information superhighway any day. The experience was as thrilling for me as it hopefully was for them. What is it about being on a thriving college campus that makes me want to buy books and tablets and pencils; to go to the campus book store and max out a credit card with logo sweatshirts, day planners, and coffee mugs; to grab a class catalog, find a comfy spot on the lawn, crunch the numbers in my bank account, and chart my educational reinvention? It’s like Disneyland for the knowledge junkie! Which ride do I want to go on first? Back home, in my Fall kitchen, the marine layer hovered over our city about 90 miles from the Pacific Ocean. The weather not only tells us what to wear, it also tells us what to eat, and my mouth began to water for roasted root vegetables as I reached for a warm sweater. Thankfully, I was able to meet that craving head-on, preparing an overgrown butternut squash for a trip to the oven. If you’ve never cut up a butternut, let me tell you the chore could almost do away with a gym membership, if you do it right. My prolific neighborhood gardeners, Angela and Andre, had generously bestowed upon me not one, not two, but 11 beaming butternut squash fresh from their warm, raised beds. I was in for a workout, as I plunged in with my biggest kitchen knife to cut them all up into large cubes to be flash frozen for future culinary delights. A couple of hours later, my kitchen countertop was a mess and my hands were aching from forcing the knife’s blade through the tough-as-granite outer skin of the butternut. But my freezer now gave off a nice orange glow (and so did my cutting board). Labor intensive as the afternoon was, it beat the heck out of reading job listing after job listing, interspersed with heavy sighs of frustration, of course. And just like that, the house smells delicious with the aroma of roasting veggies floating throughout. Just as Fall intended. If you’ve never tasted a butternut, I have to say you are missing something special. Depending on how it is prepared, the Halloween-orange vegetable is creamy and filling, with a uniquely blended flavor punch that is both sweet and savory. Though it resembles the inside of a pumpkin at first cut — complete with linen-white colored seeds tethered together with orange pulpy strings — it is best served as a vegetable side dish rather than a pie. Think baked butternut halves with cornbread stuffing, or roasted cubes with other colorful veggies. But be careful. This dish could pull the grand focus off the big bird on your Thanksgiving table. (But that might take the stress out of your day if the bird ends up a little bit dry, as they have been known to do.) This recipe is equally delicious alongside a roast chicken or barbecued tri-tip. One heaping tablespoon dried seasoning blend, such as Italian or Herbs de Provence. (I suggest using dried herbs here because fresh snipped herbs would end up bitter at this temperature and cook time. Use any dried herb combination that you and your family like, then just before serving the cooked vegetables, garnish with your favorite fresh snipped herbs for a beautiful and delicious presentation. Preheat oven to 400 degrees. Place all prepared vegetables into a large bowl; drizzle with olive oil and dried herbs; season with salt & pepper. Toss well, ensuring all veggies are coated. Spread out in a single layer on a large rimmed baking sheet and roast for 35 to 45 minutes, depending on your oven and the amount and size of vegetables used. 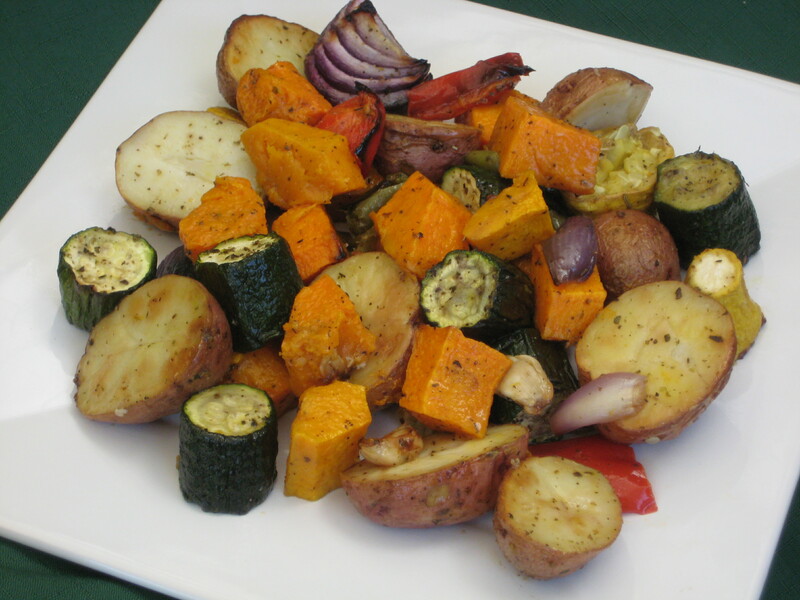 Transfer cooked vegetables to a platter, garnish with fresh herbs if desired, and serve. Yumm! This entry was posted in Comfort Food -- Savory, Uncategorized, Vegetables and tagged Butternut, campus, chicken, college, Fall, road trip, roasting, squash, summer, Thanksgiving, Tri-tip, vegetables, weather. Bookmark the permalink. Howdy I am so happy I found your weblog, I really found you by error, while I was searching on Aol for something else, Nonetheless I am here now and would just like to say cheers for a remarkable post and a all round entertaining blog (I also love the theme/design), I don’t have time to read it all at the minute but I have book-marked it and also included your RSS feeds, so when I have time I will be back to read much more, Please do keep up the fantastic job. Ahh, too many to choose from! Let’s see there’s sqsuah, warm drink weather, cooler temps, fall fashion, leaves turning pretty shades, apple picking, hockey season, Starbucks little red cups, the list could go on for ever. Oh, I love when Starbucks reintroduces the holiday red cups! 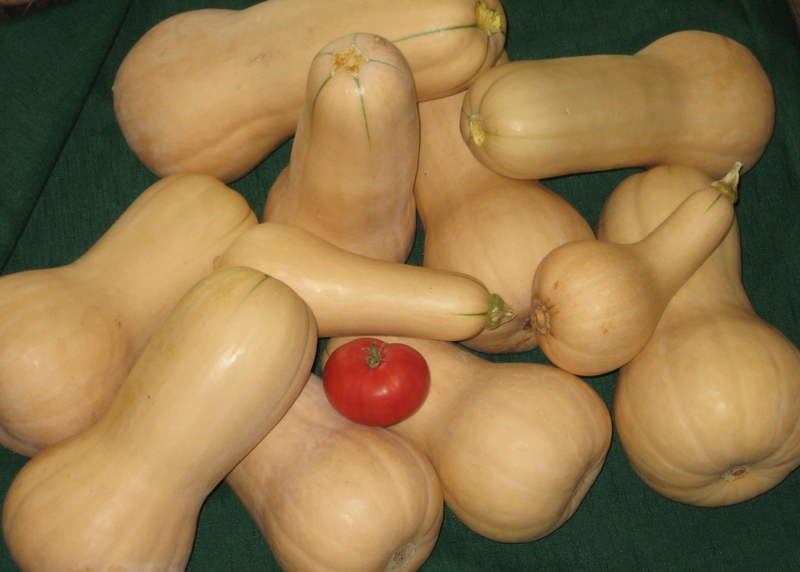 The thing about butternut sqasuh is that its a very delicate flavor, the nuttiness. I’ve made it many ways but to be honest, my favorite is to slice it in half, longways, and remove the pulp/seeds. Then I lightly coat the skin and inner surface with olive oil and a bit of cinnamon or other autumn-y spices.Then I bake it on a foiled sheet, facedown, at 400F until its nice and soft. Then just turn them over and enjoy. Sometimes I add a little butter or drizzle maple syrup. Brown sugar sprinkled on top and let to caramelize a bit is also delicious. 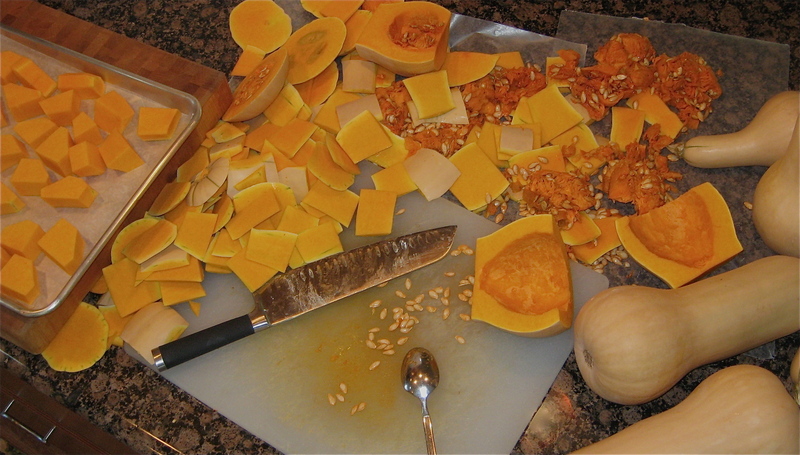 Julia, your recipe for butternut sounds delicious — especially the cinnamon and maple syrup! Thanks so much for sharing. Roasted with olive, salt and pepper is good. You can also mash it easily. Just cut into small pieces and make sure the peel is cut off. Place in a pan with a tiny bit of water and boil with the lid on. When the squash is soft, mash it with a fork and stir in some cream and butter. If there is too much liquid add a bit of potato or corn starch. Arrowroot powder will also work. This post was the perfect blend of your search to reinvent yourself and foodie insights and recipe. Thank you so much, Susan! Your feedback is always much appreciated.